A Math for Kid Softwre, cool math help 4 kid, designed for the kids at 4-13 ages to improve their math calculation ability ! just download cool math for kid to have a try ! Cool Math for Kid - QB Math 4 Kid --The cultivation of calculation ability of a kid at his early age influences a lot on his future. QB Math for Kid is a kid math softwre, a cool math help 4 kid, that are designed for the kids at 4-13 ages to improve their math calculation ability. QB Math for Kid can provide questions randomly according to your settings and can set a time deadline for these kid math problem as well. QB Math for Kid Genius - improve your kid math calculation ability! Practice Multiplication, Addition, Subtraction and Division ! Perfect math for kid software for your kid ! 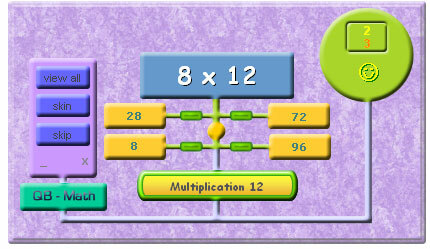 Automatically adjusts to your way of learning to make it more efficient and fun math for kid software.